White Lake in the Shuswap Region of British Columbia is one of my favourite lakes for big rainbow trout! Even though it is a two hour drive from where I live, I fish this lake several times a year! Part of the reason, other than the magnificently beautiful setting is the abundance of wildlife and the clear water with a marl/weed covered bottom is that the huge rainbow residents can be caught on tiny chironomids if presented in the correct manner! I use a Floating Line and about a 16 foot leader with a weighted, size 14 chironomid. I try to anchor in 30 to 35 feet of water and cast in to drop-offs where the water depth is around 18 feet. Often, lunker trout can be seen cruising near the bottom when their feeding mode is on! That is when the floating fly line/long leader technique comes into its own, providing that you have the right chironomid such as described below! Chironomid to Canadian Trout are what Buzzers are to UK Trout! Body : Black, brown or green wool. Thorax : Optional, thin brown pheasant. Head : Small coloured bead. 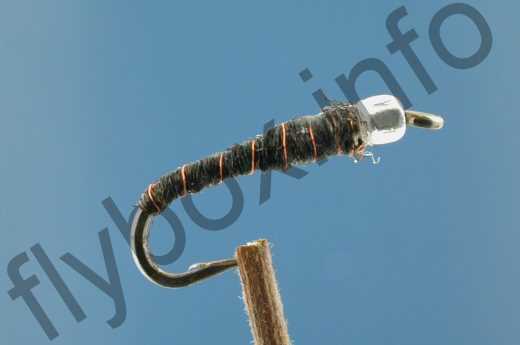 Start by crimping the hook barb in order to slide the small glass bead through to the fly head. Next, wrap 6 or 7 turns of fine lead wire next to the glass bead. I have some small transformers taken from old radio equipment that feature very fine copper wire in the windings. Tie in a piece of such wire behind the lead and then a piece of black wool, cinching it down at the hook bend. Other materials and colours can be used for the body but I find black wool produces as well as anything else! The key is to use a very thin amount so that the body, at least to the lead wrap, is extremely slender. After winding the wool to the bead, counter wrap the fine copper wire to form a rib and tie off at the glass bead. Cement and you are finished! This year, I have had more success with a clear or white bead rather than a customary red bead. Why? Could it be that the white bead resembles chironomid gills or is the flash of a clear bead irresistible to those giant White Lake rainbows? Try it yourself and find out! Currently there are no comments about the Don's Beaded Chironomid fly pattern from other fly fishermen yet.